If you want to give Katie a helping nudge towards the airport (and who doesn’t? 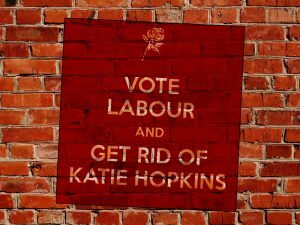 ), scroll down the page and download an MP3 that we guarantee will put a spring in your step as you cast your ballot for Jeremy Corbyn, and a smile on your face as you imagine that one-way plane ticket arriving on Katie’s doorstep. Oh, and don’t forget to go and subscribe to our YouTube channel while you’re at it!